"I'm always happy to lend an audio reseptor." Gravix is Artifice's younger brother. Just like Artifice, he too was a bounty hunter. Artifice always resented Gravix's choice of following in his footsteps because he knew it would only lead to conflict over bounties. Gravix took it all in stride and rarely returned any resentment. On and off the job, Gravix is a cool character. Nothing ever seems to bother him. Whether it's the heat of the battle or a conversation over energon tea, he always pushes the ideals of chivalry and grammar. He's so pleasant in his demeanor that even Scamp enjoys his company. Despite his docile nature, Gravix is a very effective fighter. 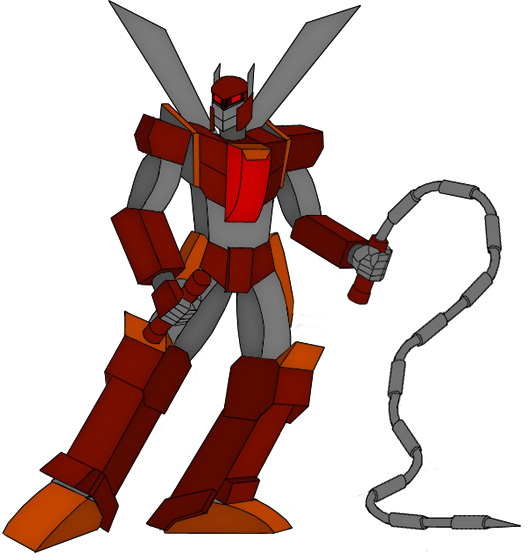 In robot mode, he wields a chain whip and a laser whip. Both weapons can be very hard to use; an asset that proves useful when an enemy picks up his fallen weapons. He also carries a missile launcher but only uses it in extreme situations. "Where's the challenge in blowing your enemy to bits?" he would often say. 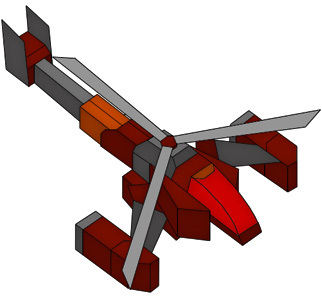 In helicopter mode, Gravix can reach speeds of 250 mph. He has dual gattling guns in hidden compartments in his belly in helicopter mode. Gravix joined LONAC after his brother Artifice was possessed by the spark of Xaraxus, leader of Spectral Death. He had an agreement with Artifice that if he was deactivated pre-maturely, he would finish whatever business Artifice had left, and vise versa. Gravix has found the crew rather welcoming and is often troubled by the thought of leaving.